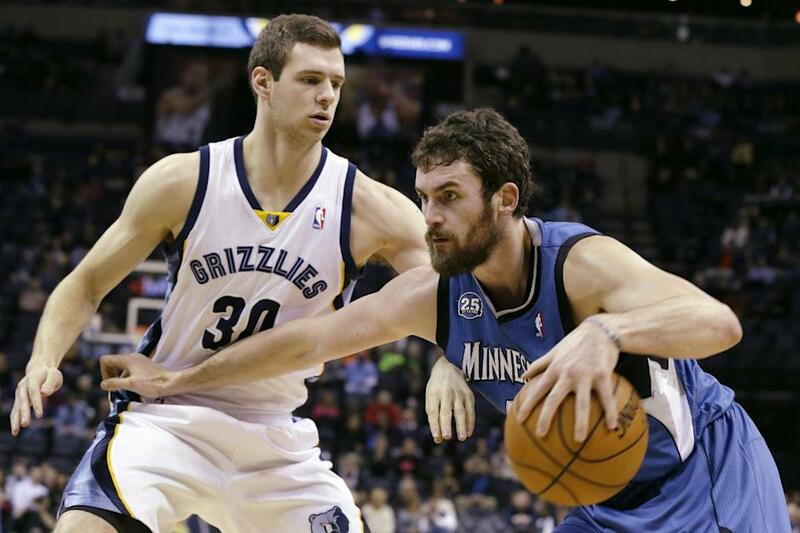 The Sneaky Fantasy Basketball Pickup for Sunday, December 15 is Jon Leuer. He’s owned in 20% of Yahoo! Leagues and 12.9% of ESPN Leagues, so many fantasy owners have been like me and slow to jump on the bandwagon. Now though, I can no longer ignore his production, and neither should you. After Marc Gasol went out with a sprained MCL, a lot of opportunities opened up. Initially it was Kosta Koufos who took the reins, and he had been great, regularly grabbing double-digit rebounds coupled with some blocks. His offensive touch, however, was very rusty. Enter Jon Leuer, the sweet-shooting big man from Wisconsin. Injuries to Zach Randolph and Ed Davis, as well as foul trouble for Koufos, allowed Leuer to get more playing time and show his offensive skills. However, now both Randolph and Davis are healthy again, but Leuer is still getting minutes at the expense of the offensively-challenged Koufos, who hasn’t played more than 16 min in his last two games. Leuer, meanwhile, is the highest Yahoo! ranked Grizzly over the last seven games, averaging 15.9 pts, 8.1 reb, 1.0 ast, 0.7 stl, 0.7 blk, 0.9 3pm, 54.1% FG, 86.7% FT and just 1.1 TO. As with many Yahoo! ranks, this is more a case of not hurting you in any categories than being so spectacular in them, but those peripheral stats add up, and that FG% is on a legit 12.1 FGA. The real question now is what happens when Gasol comes back, which should happen at the beginning of January at latest. Obviously then Leuer, Koufos and Davis all get pushed back in the rotation, stunting their values. Still, the Grizzlies have been looking for a stretch four to pair with Gasol, and there have been rumors involving trading Randolph to the Pelicans for Ryan Anderson. With Leuer on board, though, the Grizzlies may decide they already have an in-house option. In the meantime, definitely grab Leuer if he’s available and play him until Gasol gets back. Other Notable Players: Jeremy Lin sat out with a back injury, so Aaron Brooks had a another one-time nice game. Patrick Beverley continues to be a more useful real-life basketball player than a fantasy player. Lin should be back by Wednesday, and Terrence Jones should be recovered from his flu then as well…Derrick Williams seemed to be on his way to a good fantasy day but then fell off precipitously in the second half of last night’s game. Somehow Travis Outlaw ended up being the forward who got the most minutes. This doesn’t bode well for Williams, but he’s been playing so well since the Rudy Gay trade otherwise…Orlando is ramping back up to full strength with Tobias Harris’s minutes increasing and Mo Harkless back, but Glen Davis did enough yesterday to have a productive day. His minutes are in danger, though…Didn’t see this coming: instead of either Al-Farouq Aminu or Anthony Morrow getting the most of Tyreke Evans’s absence, it was megabust Austin Rivers who had the best performance. He’s regarded as a megabust for a reason though, so don’t bother latching on. He hasn’t done enough to even afford a bandwagon yet…I hate talking about the Phoenix Suns. I called them Non-Pickups for a reason. Anyway, nobody under 40% owned did anything of note, unless you consider being disappointing notable. 41% owned Channing Frye had his first good game in his last four if that counts for anything. With the selection of Leuer as the Pickup, Koufos officially completes his collapse from topping the Top Five for 12 days in a row to off the list completely in just two days. Perhaps the fact that he was on the list for that long without going over 40% owned should’ve been a sign that I was clinging on to him too hard. In any case, if Leuer is really getting the minutes Koufos used to get, then he deserves Koufos’s old spot at the top of the chart. Meanwhile, Michael Carter-Williams is missing his seventh consecutive game tonight, and Wroten’s been so good that there’s talk of playing them both together in the backcourt when MCW returns. Though that article does just seem to assume Evan Turner won’t be around for long. Hindsight: Actually, before his last two stinkbombs, Koufos had been averaging 10.6 pts, 11.5 reb, 1.1 ast, 0.9 stl, 2.0 blk and just 1.6 TO in the eight games he started since Gasol’s injury. His 40.0% FG wasn’t good, but his 81.0% FT was fantastic for a center. So no, I was not clinging on to him too hard. He was legit. There is no clear Sneaky Fantasy Basketball Pickup for Sunday, December 1. If you put a suitcase of cash in my hands and forced me to pick (I prefer that analogy to the one about a gun to my head), I’d say it’s Wesley Johnson. He’s owned in 13% of Yahoo! Leagues and 8.2% of ESPN leagues. However, I don’t want to talk just about Wesley Johnson. There is far more that needs to be said about the entire fantasy mess and goodness that is the Los Angeles Lakers. The Lakers play the fourth fastest pace in the league, which spreads extra value around to all their players. It might be spread a little thin, though, as only two players average over 30 mpg for the year, followed by nine others averaging over 17 mpg. For the past two weeks, the Lakers are one of only two teams that have eight players in the Top 120 of Yahoo! rankings (tied for first with Houston, three teams are tied for second with six each, and Cleveland is the worst and only team with just one–Anderson Varejao at #114 ). Those eight Top 120 players don’t even include former stud Pickups Xavier Henry and Jordan Hill or starting PG Steve Nash. Let’s break down the team by sections to see how recent events are affecting each. Big Men: The big story two weeks ago was how Jordan Hill had become a revelation for the Lakers, averaging 18.8 pts, 12.0 reb and 1.8 blk while shooting 61.7% FG and 89.5% FT on 19 FTs in four games. Chris Kaman got pushed back to the bench, and coach Mike D’Antoni had finally found a mobile, energetic big man to play alongside Pau Gasol, who was expected to be a dominant fantasy player sans Kobe but instead has suffered through career lows in FG% and FTA. Well in the six games since Hill’s breakout week, he’s averaged 6.0 pts, 8.7 reb and 0.8 blk while shooting 38.6% FG and 100% FT on just 2 FTs. Things got worse for Hill last Friday as he sprained his ankle. Though he still played tonight, he was limited to just 15 min. The Lakers could’ve used more, though, as Gasol was limited by a right ankle injury of his own and will undergo an MRI tomorrow. Where was Kaman through all this? Sitting through his fourth straight “Did Not Play – Coach’s Decision” since returning from a back injury. Who did that leave to take advantage of the opening at center? The Ragin’ Cajun Robert Sacre, who posted an eye-popping 12-7-4-2-3 line on 62.5% FG and 100% FT in a season-high 23 min. This was notably the best game by far of Sacre’s career. Another player who might’ve taken more advantage had he not fouled out tonight was opening day starting PF Shawne Williams. In the previous game when Hill sustained his injury, Williams posted an excellent 20-9-3-2-1 line with six threes. If Gasol’s MRI results cause him to miss time, Jordan Hill will reap the biggest benefit. However, while he’s still hobbled and Kaman is in D’Antoni’s doghouse, there are definitely openings for both Sacre and Williams. Whether Hill starts at PF or C, one of the two will start alongside him and the other is bound to be the first big off the bench. Point Guards: Of the eight Lakers in Yahoo!’s Top 120 for the past two weeks, who was the highest ranked? Surprisingly, Jordan Farmar, who averaged 14.6 pts, 3.0 reb, 5.0 ast, 1.2 stl, 0.6 blk and 2.6 3pm in just under 22 mpg in the five games before last night. This despite him being the backup PG to Steve Blake, who’s already a backup PG himself to the injured Steve Nash. Farmar has been so good that he’s still the Lakers’ top-ranked player of the last two weeks even after playing less than a minute last night before leaving the game with a hamstring injury. Farmar is expected back by the Lakers’ next game on Friday, and even Nash is expected to practice on Tuesday and could also return by Friday. Yet right now Blake is the only healthy PG on the entire team, unless they decide to call Andrew Goudelock back from Russia. Blake remains the PG to own on the Lakers, especially since Farmar’s stock just got a little riskier. Swingmen: This is where the biggest glut of fantasy value lies with the Lakers. Wesley Johnson, Jodie Meeks, Nick Young and Xavier Henry all have taken turns being the best Laker swingman of the week, and, yes, all of them are under 40% owned. Though one Laker swingman, who’s 98% owned despite not playing a single minute this year, looms over all of them. That would be Kobe Bryant, and he could return as early as Friday, although Sunday is more likely. Bringing back a player who commands that much of the offense (a polite way of saying he hogs the ball) is destined to have an impact on every player’s value, but the party is especially over for the other swingmen. So why pick up Johnson over the others? Ignore the fact that he’s the highest Yahoo! ranked Laker of the entire season and that he’s played the most minutes of every Laker except Gasol in the past week. As I said, Kobe will change everything when he returns, so Johnson’s current accomplishments must be discounted. However, there are two main reasons to think that Johnson will still retain his value. The first is his position. Johnson has been the Lakers’ starting SF since November 12. He should stay in the line-up when Kobe reclaims the starting SG spot, and he’s most likely to keep seeing a similar number of minutes. Second is how Johnson gets his value. Meeks, Young and Henry all get their value from scoring and threes. While Johnson also makes threes, a large part of his production is in averaging over a steal and a block per game for the year. Plus he’s a better rebounder than the other three. When Kobe (who averaged 20.4 FGA last year even when he still had to share the ball with Dwight Howard) returns, shots will become scarce, but defensive stats will still be readily available. As long as Johnson can hit the spot-up three regularly, he can be the prototypical “3 & D” guy who’d be the perfect fit next to Kobe. That’s why he’s today’s honorary Pickup. Other Notable Players: A few days ago, I asked when we’d finally see the Summer League MVP version of Jonas Valanciunas again. As is the case with many opposing big men, salvation came in the form of the Denver Nuggets. Valanciunas physically dominated J.J. Hickson, who only saw 14 minutes while the much larger Timofey Mozgov played 31 min and posted an awesome 16-15-1-2-2 on 50.0% FG and 66.7% FT. It was a big day overall for Mozgov, as Rudy Gay tried to Mozgov him but ended up getting LeBron’d. Hickson is a liability on defense, but–matchups aside–it’s unlikely to see him lose the start…Speaking of Denver’s bench mob, Nate Robinson has scored in double-digits in seven games in a row now, despite only once playing over 24 min (24:04 on Nov. 21). Over that time span, he’s averaging 14.6 pts, 1.4 reb, 2.7 ast, 1.0 stl and 2.3 3pm on 50.0% FG and 88.9% FT. He was in this same position as a bench scorer last year for the Bulls, except they were the 26th ranked team in pace, while the Nuggets this year are third in pace…Rookie Hollis Thompson started today while both James Anderson and Tony Wroten came off the bench. This change is likely going to stick. Thompson didn’t do much, but he does sink the fantasy values of both Anderson and Wroten…J.J. Redick will be out for the next 6-8 weeks with hand and elbow injuries, but no successor revealed himself yesterday in his absence. It certainly wasn’t Jared Dudley, who played his second-fewest minutes of his season, or Willie Green, who started in Redick’s place. If anything, it just looks like Jamal Crawford’s role will expand again…Sacramento also went bench mob on Golden State yesterday, as Isaiah Thomas, Marcus Thornton and Patrick Patterson led a furious fourth-quarter rally for the Kings. Notably, Patterson and Jason Thompson, who spent a lot of time playing with the bench unit, both outperformed previous Pickup Derrick Williams. It’s only his second game, but Williams is already experiencing why many panned this trade: there are way too many forwards on the Kings. Tonight, Williams, Patterson, Thompson, John Salmons and Chuck Hayes all played over 20 min, and that’s with Travis Outlaw on the bench and Carl Landry still to return. Though coach Mike Malone made a commitment to start and play Williams heavily at SF in his first game, it remains to be seen whether he keeps it up…Oh Reggie Jackson, you know I want to (18-5-4, 1 3pm), but I know you too well (24 min)…New Orleans fans, fantasy basketball owners, and plain old enjoyers of great NBA basketball cried in horror today as Anthony Davis fractured his left hand. There is no timetable yet for his return. Ryan Anderson joined the starting line-up coming out of the halftime break and is the obvious winner fantasy-wise. It gets cloudier after that, however. Fantasy owners would like starting center Jason Smith, who’s a superb midrange shooter and has had productive stretches this year, to gain more value, but he didn’t show that today. On the other hand, Al-Farouq Aminu sat out the entire first half but got a lot of run in the second. Right now, both are worth watching, but neither is worth adding. As expected, we say goodbye to Jared Sullinger (42%) and Channing Frye (43%) tonight, as both graduate to the 40% owned club. Nate Robinson just edges out Marco Belinelli for the final spot on account of having been productive for longer. Hindsight: I was completely wrong about Al Jefferson’s effect on Josh McRoberts. Despite playing well in his initial games next to Jefferson, McBob has seen his numbers drop across the board. That includes his already abysmal FG% and his life-saving assists and threes. This is simply a case of Jefferson taking over shots and possessions. McRoberts is droppable in all but the deepest formats…On the day I made Mo Williams the Pickup, he posted a 12-5-6-3-2 in 31 min. Since then, he hasn’t scored in double-digits or topped 24 min. Looking at his numbers before and after his five productive games in mid-November seems to tell me I fell for a fluke. This season I will highlight a notable player, based on the games played each night, who’s available in at least 60% of Yahoo! Fantasy Basketball leagues. 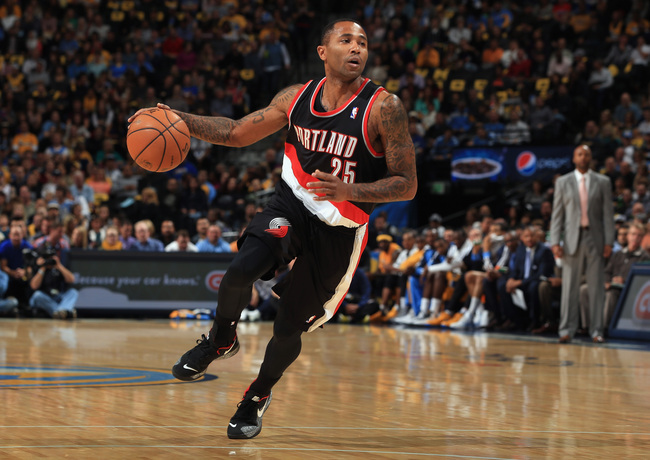 The Sneaky Fantasy Basketball Pickup for Sunday, November 17 is Mo Williams. He’s owned in 17% of Yahoo! Leagues and 11.2% of ESPN Leagues, but there’s been a developing trend in Portland that should raise his value. Understandably, there was a drop-off in Mo Williams ownership after he went from starting PG in Utah last year to backup PG in Portland this year. Yet he has now had two productive games over 30 min, and he’s averaging 15.0 pts, 5.8 ast, 1.3 stl and 1.5 3’s over his last four as the Blazers have been playing more smallball. They’ve won all four games (and are surprisingly good all-around this year), so there’s no reason to believe this won’t continue. Is he legit? Williams has seen both his per-game and per-minute averages go down this year as his role has been reduced. However, in years past he’s been an excellent source of points, threes, assists, and steals with good percentages for the PG position. He likely won’t ever have a role as prominent as he did back in Milwaukee or Cleveland again, but, if Portland will continue playing him 30 mpg and let him run the second unit, he’s a good bet to give you a good portion of those stats again. Other Notable Players: Jodie Meeks. By this point, you should already know…I can pretend like Travis Outlaw’s 18-6 and 2 3’s in 17 min or Wesley Johnson’s 13 pts and 2 blk in 21 min meant something, but really nobody else under 40% owned did anything notable tonight. Hindsight: Jordan Hill (24-17 tonight) and Steve Blake (16 ast) jumped over 40% owned quickly, but their ownership needs to be even higher. Blake’s value may drop when Nash finally returns (which could be this week or next), but given Nash’s performance this year, Blake might be primary ballhandler until Kobe comes back. Hill, on the other hand, just seems legit. This season I will try to highlight a notable player, based on the games played each night, who’s available in at least 60% of Yahoo! Fantasy Basketball leagues. 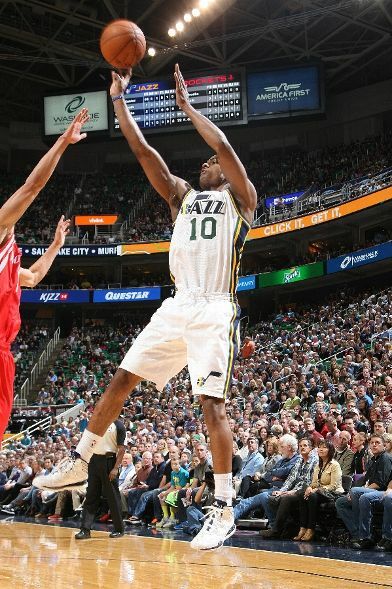 The Sneaky Fantasy Basketball Pickup for Saturday, November 2 is Alec Burks. He is owned in 28% of Yahoo! leagues, and that number isn’t climbing despite some consistent production and me pimping him in casual passing last Wednesday to my rabid fan base of one or zero readers. We’re approaching the end of the first week, which means the clear-cut early waiver wire stars are disappearing (e.g. Miles Plumlee, Lance Stephenson, MCW). Thus anyone still scouring free agents to replace a poor draft pick is left to look for consistency or to stash a project in roto leagues. Alec Burks definitely falls under the former category. He’s averaging 18 pts, 3.7 reb, and 3.0 ast in a little over 32 mpg, and his numbers have been fairly consistent from game-to-game. Like everyone in Utah, he’s getting a lot of opportunities this year because five of the top six players in mpg on last year’s team have left, replaced essentially by cap space and future draft picks. Burks is a former Utah lottery pick that has really improved his on-ball defense and is getting rewarded with significant playing time. Based on his per-36 min numbers from past seasons, factoring in some typical third-year player improvement, and dropping in a giant dollop of flat-out guessing, I’d expect Burks to put up 18-4-2 with one steal, less than a three, and percentages that won’t kill you from the SG position moving forward. Is he legit? He’s legit for what he is, a decent contributor in a deep league or when you need to rotate a guy in, but he’s not going to win your week for you. I think his role on this team is safe, even after Trey Burke returns. Though if he does get bumped up to the starting line-up, I can’t see his stats improving much, unless Coach Tyrone Corbin listens to this outrageous suggestion to play him at PG. Other Notable Players: Look who’s scored 14 points in every game. None other than the Round Mound of Ratatouille: Boris Diaw. Tim Duncan played his first full game of the year, and Diaw still played his most minutes this year. Is it really worth holding on to a guy like Amare Stoudemire (58% owned) or Cody Zeller (50%) over him (5%)?…I stand by what I said about Josh McRoberts. He didn’t get much playing time last night as he was being abused by Anthony Davis, but no Charlotte starter played more than 27 min in this blowout…I’m not worried about Zaza Pachulia’s bad night, but it’s worth mentioning for the second night in a row that John Henson had a productive game. Larry Sanders’s poor play is worth monitoring, as both Pachulia and Henson have value while Sanders is sinking his…Tony Wroten (of the best-in-the-league 3-0 76ers!) is sort of a poor man’s Alec Burks right now, but with better 3-point shooting. Until he’s the one getting 33 mpg instead of James Anderson, however, he’s simply Watch List…Both Jason Thompson and Travis Outlaw put up garbage-time double-doubles as Sacramento got crushed by Golden State and DeMarcus Cousins was benched for doing DeMarcus Cousins-ish things. Thompson is likely more legit and most worth watching, as Patrick Patterson doesn’t seem to be cutting it as Carl Landry’s replacement. Accountability: Nate Wolters turned out to be the biggest beneficiary of Brandon Knight’s injury, not Gary Neal. Oops. With the Bucks off until Wednesday and Knight likely to return then, however, neither are worth a roster spot anymore.